“The war tried to kill us in the spring,” begins this breathtaking account of friendship and loss. In Al Tafar, Iraq, twenty-one-year old Private Bartle and eighteen-year-old Private Murphy cling to life as their platoon launches a bloody battle for the city. In the endless days that follow, the two young soldiers do everything to protect each other from the forces that press in on every side: the insurgents, physical fatigue, and the mental stress that comes from constant danger. Bound together since basic training when their tough-as-nails Sergeant ordered Bartle to watch over Murphy, the two have been dropped into a war neither is prepared for. As reality begins to blur into a hazy nightmare, Murphy becomes increasingly unmoored from the world around him and Bartle takes impossible actions. Took a while to get into the book but enjoyed it. Very good portrayal of what it means to go to war and the consequences. Sterling was a very interesting character. Heart of gold but very rough exterior. Every politican thinking of sending troops to was should read it. The book made me angry, re: the sending of troops and then forgetting about them. Very descriptive language, very poetic. Difficult to get into but then really enjoyed it. Beautifully written and allowed the reader to actually picture what it was like to be at war in the desert, his descriptions of all the dust etc. painted the pictures. Excellent title. The verse at the front summed up the book very well. The R&R in Germany showed just how damaged Sterling already was. The change between being at war and being at home showed just how we think particularly those with post traumatic stress syndrome. Would never have chosen to read it but really glad I did. Loved the writing and got alot out of it. The writing actually placed you in the situation. 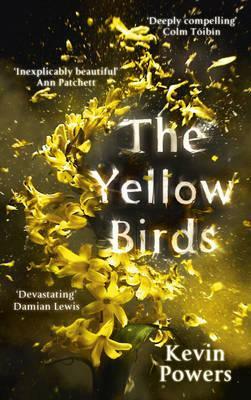 This entry was posted in All, Book Reviews, Fiction, Recommended Reading and tagged Kevin Powers, Parramatta City Library, The Yellow Birds by admin. Bookmark the permalink.